The studios behind five gorgeous games kindly opened up their sketchbooks and discussed inspirations, how each game's art style was formulated. This article was originally published in PC Gamer UK issue 327. For more quality articles about all things PC gaming, you can subscribe now in the UK and the US. The games featured are Apotheon, Haiku Adventure, Gris, The Collage Atlas and Luna (pictured above) Click to see the images at a larger size. Alientrap’s Apotheon illustrates its ancient Greek story with imagery influenced by black figure pottery. But before becoming a 2D platformer clad in the motifs of ancient Greece, Apotheon was an open world sci-fi project set on a space station; a story of godlike beings manipulating humans from on high. “Eventually we cut away the space parts and just decided on making a game about Greek mythology itself,” says Alientrap cofounder and creative director, Jesse McGibney. “By that point, it seemed like a no-brainer to use the art style that was most associated with those myths; black figure pottery.” For a while McGibney was torn between black figure style (black figures on a red background) and red figure style (a later style with red figures on a black background). “In the end we settled on black figure for readability, but I took a lot of design cues from the more complex styles of the red figure art,” McGibney says. The finished game's art style is instantly recognisable even though it needed some tweaks to be player-friendly. Colour was another challenge. Expanding the colour palette to include blues, yellows and greens helped differentiate areas, and little pops of colour could help highlight objects and other characters. Apotheon also diverges from the pottery in that its scenes have some visual depth—a foreground and a background separated by tinted fog—which helps with legibility. The earlier idea was futuristic space soldiers meets antiquity. Haiku Adventure is the work of James Morgan and Ceri Williams. It channels their conversations about growing up on islands and their shared connection with nature into a game. The art style draws heavily on the Japanese ukiyo-e woodblock print tradition and, although still in development, will be featured in an exhibition at the William Morris Gallery. The developers used collages as well as their own printing methods, while creating the game. Research included visits to ukiyo-e displays and a printing workshop during Williams’ honeymoon to Japan. Other valuable resources were the V&A’s collection, the British Museum’s Hokusai: Beyond the Great Wave exhibition, and the website www.ukiyo-e.org, which collects hundreds of thousands of prints in a database. “Primarily we want to faithfully get across the feeling of what it’s like to look at the natural world through the framing of ukiyo-e,” explains Williams. One of the biggest challenges is figuring out the composition of a scene. “The original prints we reference have really precise framing, which is less easy to capture when parallax and animation causes constant changes as players explore scenes,” says Williams. To resolve this, the pair is focusing on how players are encouraged to pause in specific places so they experience particular framings. Another consideration was how to add a sense of ukiyo-e printing’s physicality to a digital product. Adding visible woodgrain patterns to larger areas of colour is one way of doing this. Williams used to work at a joinery so he’s been back to raid their wood offcut pile, scanning these offcuts to create a texture library, which can then be used in the game. A sketch of a river scene helps with composition. But tapping into the traditional artforms of another country carries the risk of appropriation or exoticism. I ask how Williams and Morgan are handling this. Conrad Roset’s main focus for the poetic platformer Gris was on creating an illustration that players could get lost in. Roset is an artist and illustrator whose work has been exhibited in galleries, featured in magazines and books, and commissioned by brands like Adidas and Zara. Gris was his opportunity to create a world, swapping the static for the fluid. The game unfurls as a tale of loss and sorrow—a dreamy experience that’s more about evoking a kind of wordless enchanted bittersweet mood than offering up a thesis. As such, the imagery is the star of the show. Shapes cluster into plants, buildings form out of collections of columns, platforms and staircases. A gigantic bird shifts between a recognisable silhouette and an animated fluid mass. Flowers and trees need to work for platforming as well as the look of the scene. Gris picks up motifs from Roset’s existing work. There are blooms of watercolour pigment, neat ink outlines, and a fascination with the bodies of lithe women. His style is spare, using a lot of white space to balance punches of colour. In translating that to a digital environment, he worked with his partners Adrián Cuevas and Roger Mendoza at Nomada Studio to make sure the filters, textures, watercolour effects and so on would produce the right look. Bringing Roset’s work to life began with hand-drawn sketches, including watercolours. Once he and Nomada started the game, the art and animation moved to Photoshop but with an emphasis on maintaining the organic look and feel. For example, there’s an animation whereby a cloud of colour blooms across the screen. For this the team used a video of paint falling into a bowl of water and then adjusted it in Unity so it looked like it was blooming from the right part of the screen. Those floods of colour are narratively important, too. They happen when a player gains access to a new part of the colour palette. Sketches allow an artist to capture the main shapes of a scene. As well as Roset’s own work, Eyvind Earle’s Disney artwork is a reference point, particularly his concept art for Sleeping Beauty. Those images use layers to create the illusion of depth without linear perspective—a technique that translates well to a 2D platformer. Earle’s influence is most evident in Gris’ forest sections where squared-off topiary is held aloft by tree trunks so slender they’re just vertical lines, with other vertical lines as branches. The Collage Atlas is a game that I tend to think of more as a digital papercraft theatre. Cut-outs of bushes and lampposts—each drawn in black ink using 0.03mm fineliner pens—emerge from the rough white watercolour paper ground. Arranged in layers around a central gap, these cutouts create a garden walkway, leading towards an intricate, wrought iron-style pen-and-paper gazebo. Old fashioned lampposts and wrought-iron gates are recurring motifs. As well as trees, pinwheels and boats, The Collage Atlas uses text as a physical object in the game. For example, sometimes letters appear jumbled unless you stand at the exact right viewpoint. Physical text has been integral to the game since Evelyn decided it should be a game in a 3D space and not a picture book, as was the initial idea. Agency and hope are key themes for Evelyn in this project. In pursuing those themes, The Collage Atlas is overtly reactive in ways developers usually try to hide. For example, assets rotate to face you as you move around, or move only when you look at them. The effect is beautifully delicate. 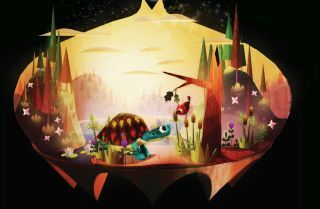 It’s odd to think that Luna—a game with such rich textures and which plays out its gentle story in a variety of interactive terrarium-style spaces—was ever intended as a solely 2D game. Porting it to VR happened about halfway through development after the team experimented with taking a version of Luna to the Oculus platform. Instead, Hernandez would greybox (block out) the basic forms of the environments and the team would see how different arrangements felt in the headset. Modeler Allena Hail would then add definition to the greybox using Hernandez’ paintovers (images where an artist has painted over an image of the space to show how it should look) for reference. Luna’s own blueprints take inspiration from the illustrations of Mary Blair, the woodblock prints of Umetaro Azechi, the animations of Jirí Trnka, and the sculptures of Lee Bontecou and Harry Bertoia. Funomena also looked at the folkloric style of the 1975 Yuri Norstein film Hedgehog in the Fog. “Eventually, we set those influences aside and allowed all of the inspiration we absorbed to filter through our own vision,” says Hernandez. Reference images help inform the look of these plants, as do other artists' work and the game tech itself. The earliest concept art for Luna has a beautiful patchwork quality.